After the holidays, it’s time to pack the bucket and spades away and get back into the routine. It has been a volatile August. A bear call in a post in early May is looking pertinent (as is the post on a suggested tie-up between Paddy Power and Betfair!) given the 7% drop in the S&P500 since then, although it is more likely dumb luck. The market concern is centred on the prospects for China’s economy. Growth is widely believed to be a lot lower than the official 7% with exports down, concerns about zombie loans and the political ramifications of managing a lower growth economy. 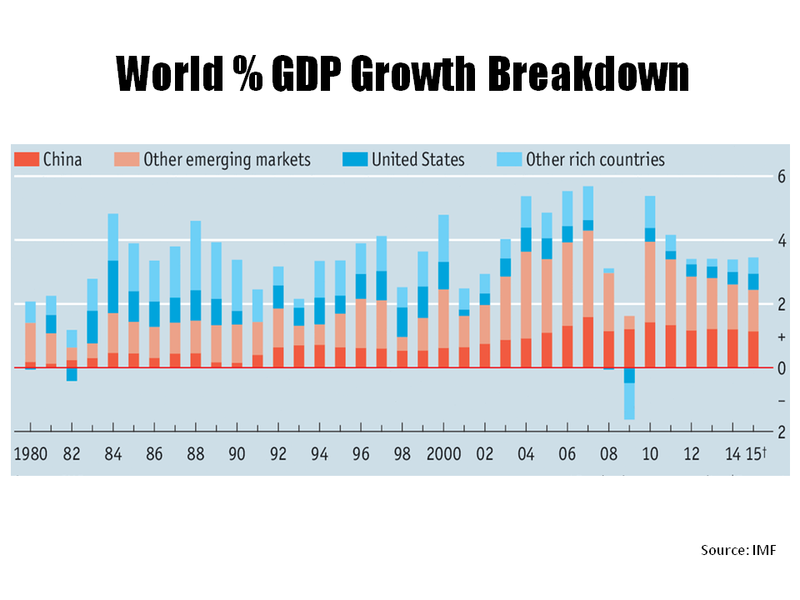 The Economist, in an article this week, highlighted the potential impact of a slow-down in China and other emerging markets on global growth, as per the graph below. Amongst the usual holiday reading, I brought two books on economics for the beach. The first was the FT’s Martin Wolf’s “The shifts and the shocks” from late in 2014 and the second is the recently published “Postcapitalism” by Paul Mason. Although often a laboured read, I did manage to finish the former whilst I only got to start the latter (which is a much easier read). Reading Wolf’s book as the China led volatility was unfolding only led to an enhanced feeling of negativity from the themes of the book, namely the lessons as yet unlearned from the crisis. Wolf competently covers much of the causes of the crisis and its aftermath – a global savings glut and associated global imbalances, an expansionary monetary policy that ignored asset prices and credit, an unstable liberalized financial system supervised by naïve regulation. 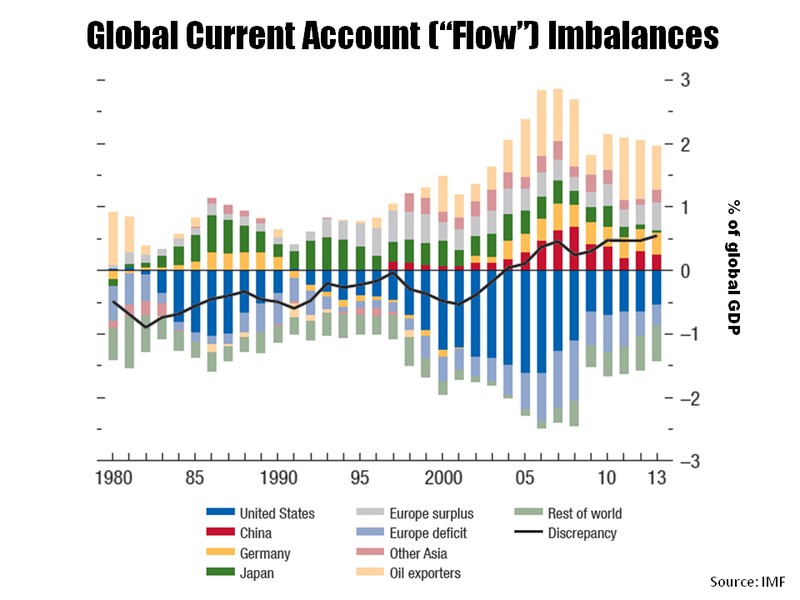 The following graph from the IMF reminds of the global imbalances that proved so toxic when combined with a rampant financial sector. Wolf questions the “belief that government borrowing is the illness for which private borrowing is the cure has survived all that has happened”. Some of the solutions that Wolf proposes include much higher capital requirements for banks than is currently being implemented under Basel III, deleveraging initiatives such as tax incentives towards equity and away from debt, corporate tax changes to encourage corporate investment, changes in debt contracts to convert to equity on macro-economic metrics, policies to address income inequality and to promote research and education. A more radical reform of the financial system, along the lines of the Chicago Plan for 100% reserve banking whereby the ability to create money is taken away from profit seeking banks and given solely to central banks, is a step that Wolf favours but believes is unrealistic given the realpolitik of the developed world system. On the globalised financial system, Wolf believes that the “obvious truth that unless regulation and the supply of fiscal backstops is to be much more global, finance should be far less so” and suggests a greater segmentation of the world’s financial system. There are many themes in Wolf’s book that got me thinking and I am hoping that Mason’s book will do the same, albeit from a totally different perspective. I think the market volatility has more time to play out and hopefully my summer reading, although yet to be completed, will assist in understanding what may come next. This entry was posted in Economics and tagged 100% reserve banking, a global savings glut, Basel III, BetFair, Chicago Plan, China, China economy, corporate tax changes, deleveraging initiatives, emerging markets, expansionary monetary policy, global imbalances, higher capital requirements, income inequality, lessons as yet unlearned, lower growth economy, Martin Wolf, my summer reading, Paddy Power, Paul Mason, political ramifications, Postcapitalism, rampant financial sector, slow-down in China, tax incentives on equity, the Economist, The shifts and the shocks, unstable liberalized financial system, volatile August, zombie loans. Bookmark the permalink.